Irina Tsikurishvili and Irakli Kavsadze in Synetic Theater's "Antony & Cleopatra." Photo credit: Graeme B. Shaw. As the basic plot of ancient Rome and Egypt should be well familiar to audiences, this may be the most accessible of Synetic’s wordless Shakespeare productions to date (and if all you know is HBO’s Rome, you’ll do fine as well). Characterizations are strongly defined, starting with Ben Cunis as Antony and choreographer Irina Tsikurishvili as Cleopatra – each powerfully present and switching effortlessly between sinewy sexuality and forceful physicality. Tsikurishvili embodies Cleopatra in a definitive way for me, from her youthful power-grab to her jealous rage to the riveting moment she realizes all is lost. Cunis clearly marks Antony’s journey from second-in-command, his rising ambition at war with his loyalty to Rome. As fight choreographer Cunis also does an amazing job – the battle scenes are brutal, with actual sparks flying off swords as actors propel themselves through the air with frightening intensity. Ben Cunis and company in Synetic Theater's "Antony & Cleopatra." Photo credit: Graeme B. Shaw. A match for him is Philip Fletcher’s Octavian, both amusing and devious, whose vulgar duet with a Cleo effigy is a hilarious showstopper well contrasted with his cold grimness as he also gambles to win the world. And the remarkable flexibility of Alex Mills is again on display as a character perhaps best described as the serpentine spirit of Egypt itself, a golden demi-god or demonic familiar to Cleopatra, whose motivations are unclear and potentially malevolent. Alex Mills in Synetic Theater's "Antony & Cleopatra." Photo credit: Graeme B. Shaw. So many gorgeous images are on display here – red gloved assassins stamping Caesar to death, dead soldiers floating underwater at the battle of Actium, a shower of grain released from Egypt’s death to Rome’s renewal. The production design may be the best for Synetic yet – Anastasia Rurikov Simes has set, costume and props strongly defined in an almost Art Deco world (I really want Cleopatra’s red and black dress, a perfect illustration of her lust for power and sorrow at its loss. ok, it’s just plain stunning as well!). 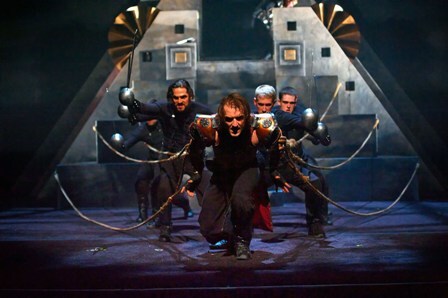 Colin K. Bills’ lighting design creates clear separation between Rome’s harsh militarism and Egypt’s mysterious danger. And the sound design of Irakli Kavsadze and Konstantine Lortkipanidze (also original music composer) seamlessly supports the action. I raved about last year’s A Midsummer Night’s Dream, one of the multi-nominated productions, and I’ll continue to rave - this is a company bringing a high level of innovation and daring to the DC theatre scene, and we’re truly lucky to have them. Prepare to be transported to the ancient world for a night of wonder. I can’t wait to see this. Antony and Cleopatra is probably Shakespeare’s most flamboyant plays and deserves a spectacular presentation.